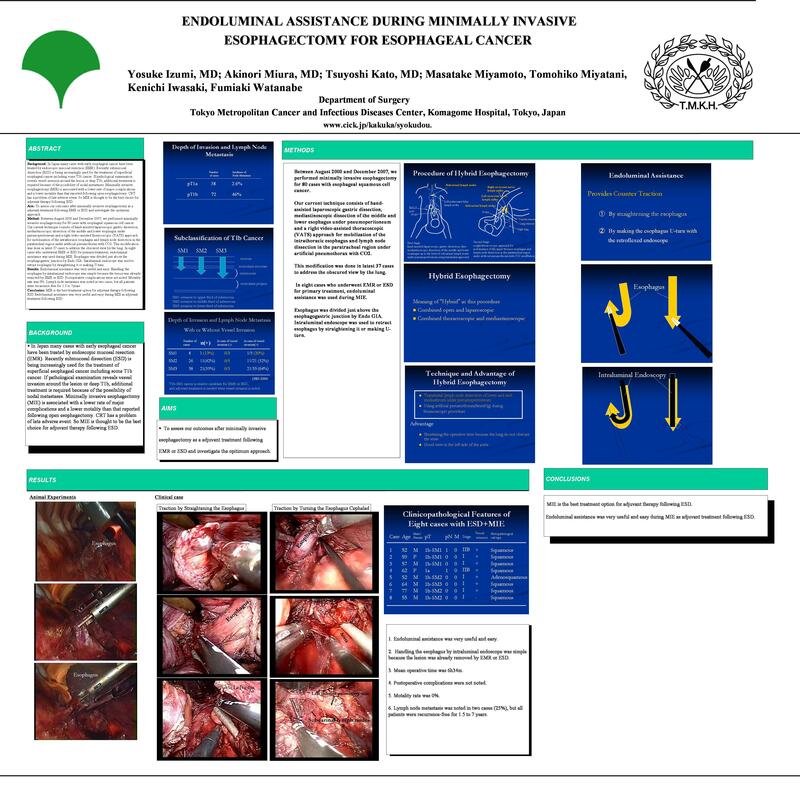 Background: In Japan many cases with early esophageal cancer have been treated by endoscopic mucosal resection (EMR). Recently submucosal dissection (ESD) is being increasingly used for the treatment of superficial esophageal cancer including some T1b cancer. If pathological examination reveals vessel invasion around the lesion or deep T1b, additional treatment is required because of the possibility of nodal metastases. Minimally invasive esophagectomy (MIE) is associated with a lower rate of major complications and a lower motality than that reported following open esophagectomy. CRT has a problem of late adverse event. So MIE is thought to be the best choice for adjuvant therapy following ESD. Aim: To assess our outcomes after minimally invasive esophagectomy as a adjuvant treatment following EMR or ESD and investigate the opitimum approach. Method: Between August 2000 and December 2007, we performed minimally invasive esophagectomy for 80 cases with esophageal squamous cell cancer. Our current technique consists of hand-assisted laparoscopic gastric dissection, mediastinoscopic dissection of the middle and lower esophagus under pneumoperitoneum and a right video-assisted thoracoscopic (VATS) approach for mobilization of the intrathoracic esophagus and lymph node dissection in the paratracheal region under artificial pneumothorax with CO2. This modification was done in latest 37 cases to address the obscured view by the lung. In five cases who underwent EMR or ESD for primary treatment, endoluminal assistance was used during MIE. Esophagus was divided just above the esophagogastric junction by Endo GIA. Intraluminal endoscope was used to retract esophagus by straightening it or making U-turn. Results: Endoluminal assistance was very useful and easy. Handling the esophagus by intraluminal endoscope was simple because the lesion was already removed by EMR or ESD. Postoperative complications were not noted. Motality rate was 0%. Lymph node metastasis was noted in two cases, but all patients were recurrence-free for 1.5 to 3 years. Conclusion: MIE is the best treatment option for adjuvant therapy following ESD Endoluminal assistance was very useful and easy during MIE as adjuvant treatment following ESD.